Utilizing the established Dräger PSS Pneumatics and cylinder strap design, the Dräger PSS 5000 combines established technology, state-of-the-art materials and innovative thinking to create a SCBA for virtually any application. The Dräger PSS 5000 has been designed to be not only comfortable but also extremely stable during use in harsh firefighting environments. Incorporating a rigid harness connection to a fixed-height back plate, advanced harness materials and a pivoting waist belt, the Dräger PSS 5000 remains in position regardless of the task in hand. 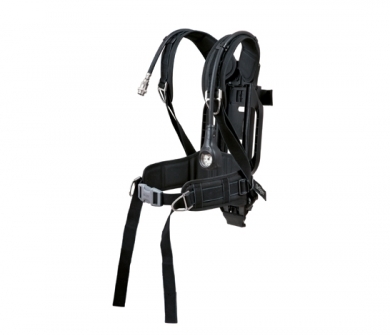 Harness is a cost effective option for every­day use, offering a high level of comfort and durability. Easy to don and doff mate­rials and simple pull forward and down adjustment mechanisms make the DS harness a versatile option for a wide variety of applications. Utilizes materials to withstand the high wear and tear that firefighters face daily, whilst providing an enhanced level of comfort and function over the DS harness. Incorporating hardwearing stainless steel buckles and long-life Aramid blend web­bing, the DP is ideally suited to extended wear and frequent use. To minimize the risk of snagging and to guard against physical damage, both the gauge and air supply hoses are integrated within channels in the Dräger PSS 5000 back plate. The LDV, Gauge and Rescue hoses can now be routed over the left and/or right shoulders (2 hoses per side), allowing the Dräger PSS 5000 to be configured to any standard. Conventional waist mounted hoses can also be fitted making the Dräger PSS 5000 one of the most versatile SCBA’s available. Dräger has revolutionized the use of breathing apparatus by creating a range of components that can be selected in com­bination to meet the specific needs of the firefighter regardless of the task. The Dräger PSS 5000 has been designed to be fully compatible with the globally established Dräger Bodyguard 7000 electronic signal and warning unit, and the newly integrated PSS Merlin Modem. For maximum protection the Dräger Bodyguard 7000 has an innovative com­pact design that integrates the power supply and pressure sensor modules with­in the back plate, creating a balanced weight distribution. Real-time monitoring of essential information such as time-to-whistle (based on current air consumption) and cylinder pressure is communicated via a lightweight handheld electronic gauge and display and/or, a facemask-mounted Head’s Up Display (HUD).